BRAND NEW FORMAT! Based on Magnums Butlers International's world-renowned training program, the Luxury Butler Service Handbook is jam-packed with valuable information for new and established butlers. From Personal Development and Guest Interaction skills, to Communication, Table Setting and Beverage Service Skills, this handbook has over 100 sub-modules. It is the cream of the crop and a must for every butler. Please note: Shipping prices are based on air mail through Australia Post. This shipping option is not trackable. If you require tracking and/or insurance, please email accounts@magnumsbutlers.com for an individual quote. Based on Magnums Butlers International's world-renowned training program, the Luxury Butler Service Handbook is jam-packed with valuable information for new and established butlers. 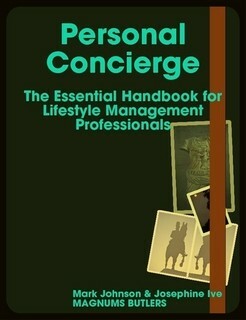 Mark Johnson, with co-author and editor Josephine Ive, has written a 70-page comprehensive and entertaining guide to personal concierge services so that others can benefit from his experiences in understanding the role. In the handbook, Mark provides a wealth of information on the various roles within a household, personal presentation and conduct, and examples of services you will be expected to perform. The authors also give valuable insights on how to be prepared for any eventuality, from event planning and floristry services to shoe repairs and diamond purchasing! 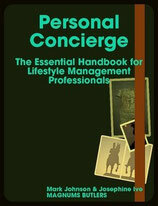 In addition, the role of business personal concierge is highlighted with such diverse duties as gift and office equipment purchasing, restaurant reservations and catering. The handbook is designed to assist you in developing your own sense of style, service, resources and developing those anticipation skills as well as being prepared for the usual, and the unusual, requests that may come your way. 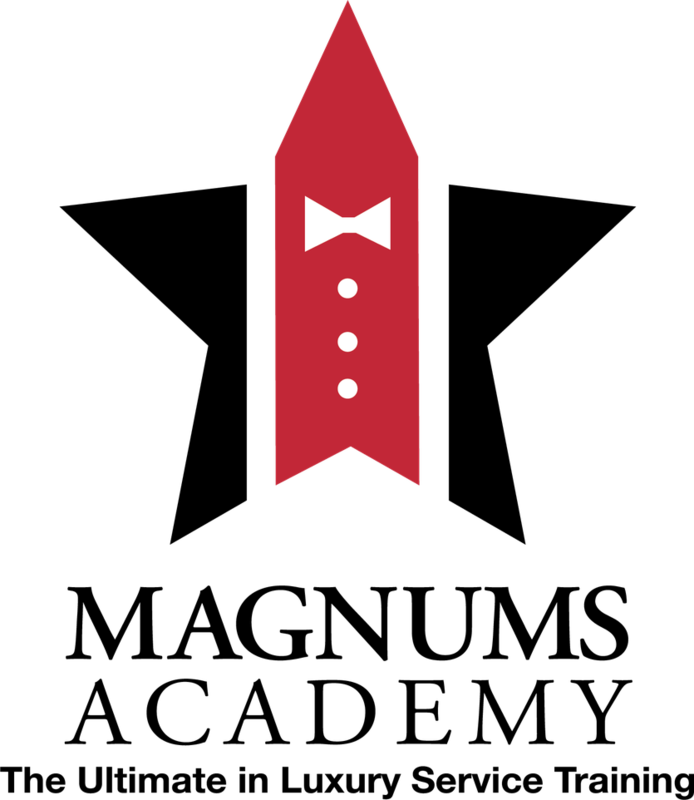 Assists you in developing your own sense of style, service, resources and developing those anticipation skills as well as being prepared for the usual (and unusual!) requests that may come your way. 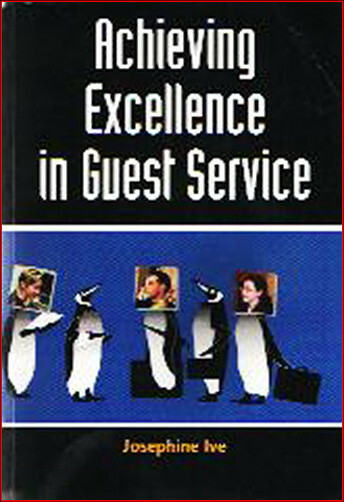 This comprehensive 262 page manual is designed to help service staff wherever guest service is important. 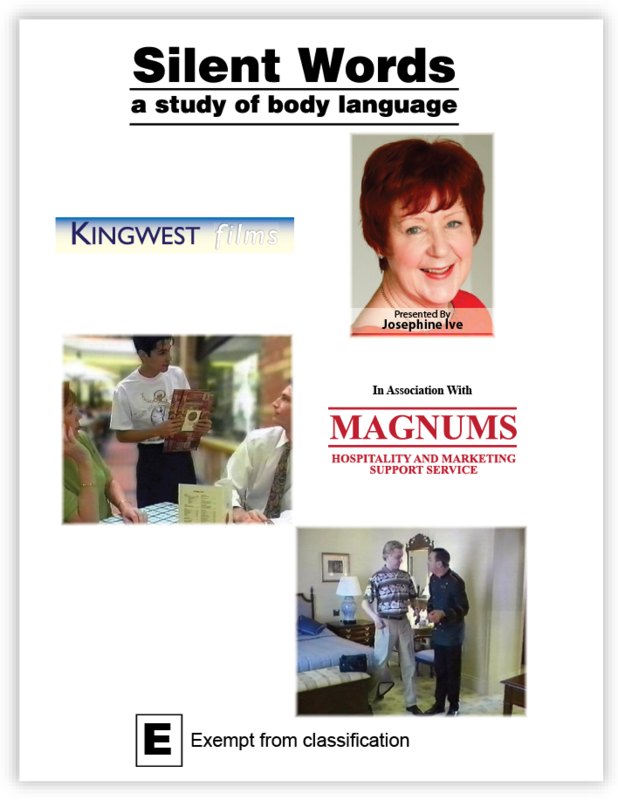 Now, a leading textbook in colleges and training establishments, it is a book packed full of ideas and information on every conceivable aspect of guest service from forms of address, decoding airline tickets and folding and packing clothes to fundamentals like serving beverages and making beds. The many illustrations, tables, glossaries, and the author's helpful and often amusing anecdotes, help make this wealth of information clear and memorable. Training exercises are provided to help both student and trainer. It is an invaluable resource and will be of great use to hotels and resorts' training departments as well as students and teachers alike. This comprehensive 262 page manual is designed to help service staff wherever guest service is important. This book almost needs no introduction, it has now sold over 43,000 copies since it was just 'tentatively' published in 1983. 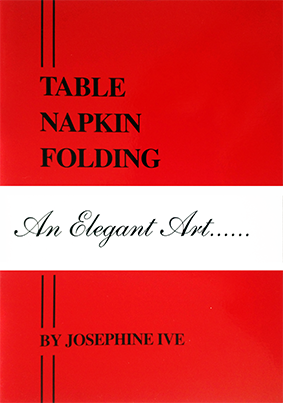 However, it features eighteen napkin folds with clear instructions for use with paper or linen napkins. In the centre-fold it offers a reproduction of a catalogue page from Harrods 1895 in London, reminding us of the bygone prices of 'double-damask' dinner napkins. The book is a must for those fascinated by the thought of transforming a napkin by 'Origami' into a real conversation piece - see page 21! The book is a must for those fascinated by the thought of transforming a napkin by 'Origami' into a real conversation piece! In the same time it takes you to say By Jeeves! Josephine Ive can show you just how a butler would pack your suitcase to creaseless perfection. Because whilst you may not be able to afford your own butler or valet By Jeeves! 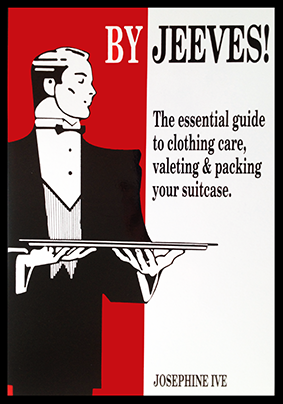 is all you need to outlay, to learn how to care for your clothes just the way the famous butler Jeeves would. And let's face it - most of us could do with a little professional advice on how to pack your suitcase so that clothes don't look as if they've come from the lower reaches of the ironing basket! Or even how to iron the perfect shirt (any good butler will tell you there are nine steps you should take). By Jeeves! the DVD, is your 'essential guide to valeting and packing your suitcase’, and is packed with loads of useful information. In the same time it takes you to say By Jeeves! Josephine Ive can show you just how a butler would pack your suitcase to creaseless perfection. Josephine Ive shares her wealth of world wide experience in creating the perfect ambience for every dining occasion. 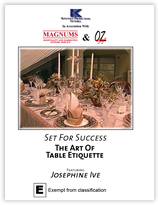 From the very formal to the more casual dinner, Josephine shows us in simple step by step form how to dress your table up or down, providing us with many and varied tips on how to make your next dinner function not only enjoyable, but rewarding. The harmony is created by combining elegant yet simple elements, with careful consideration to the desired atmosphere. With this informative video your dinner party will prove an outstanding success! 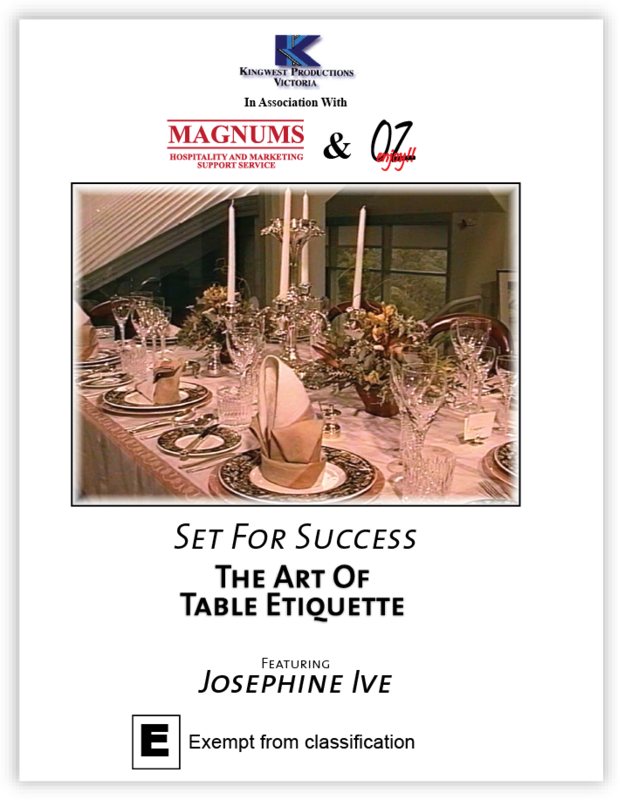 Josephine Ive shares her wealth of world wide experience in creating the perfect ambience for every dining occasion. Do They Really Mean What They Say? How do you know? This video program will help to demystify body language and non-verbal communication - remember, you never get a second chance to make a first impression. Recorded on location in Australia, South America, Singapore and PNG, Silent Words tells us what people really mean. Since body language has a clear value in business situations, it follows that in guest and customer service it is equally important. DVD: Do They Really Mean What They Say? How do you know? 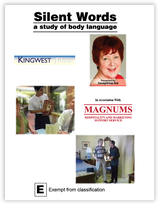 This video program will help to demystify body language and non-verbal communication.